Octagon Notes: What do you thirst for? Lent 4 Holding the Margarine! A good many years ago, I remember being stranded at night in dense fog on the top of the Roberts Ridge in the Nelson Lakes. We camped the night but had no water. It had been a long and very thirsty night – we were desperate for a drink. In the morning, as the fog cleared a long way down, we spotted a small tarn and could fill a billy. One of the last words from the cross is when Jesus says ‘I thirst’. That points us to a fact of bodily existence: that adequate hydration is needed for us to survive and, that a consequence of extreme dehydration is suffering and death. The First Testament lesson from Exodus speaks of thirst in the great desert experience of the people of Israel. In Exodus it is at Mt Horeb that Moses, threatened by the people who fear dying of thirst, strikes the rock and water flows. Other sources know Horeb by another name, Sinai. So, consider this: on the mountain where Moses received the Ten Commandments, he also strikes water. Is this sheer coincidence that the law of God and the water of life are found on the same holy mountain? Or are we meant to understand God as the source we seek, the source of life. So it is also with the well at the centre of this remarkable and strangely intimate encounter between Jesus and this Samaritan woman. This is at Jacob’s well and refers back to the story of Jacob and Rachel, how they meet at the well at midday and Jacob helped Rachel (whom he later married) to move the stone over the top of the well so that their different flocks could be watered. To remember this story in this context is to realise that the different flocks of what were sheep in Jacob’s time, are in this instance Samaritans and Jews. This is the place where different flocks, different peoples and traditions meet – at the source, the well of life. 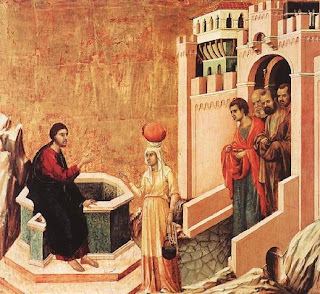 Jesus, a young rabbi, crosses the cultural boundaries – the outer limits – by striking up a conversation at midday with this Samaritan woman; even the hour of the day, a time when women would not normally draw water, suggests to some interpreters that she is a social outcast and may be morally compromised – something also suggested by references to her past marital adventures and her current illicit union. This is about the sixth hour, and Jesus is on his journey toward Jerusalem and the journey’s end, when he asks the woman for a drink and there is this strange conversation that follows as he makes his request: He says "If you knew the gift of God, and who it is that is saying to you, 'Give me a drink,' you would have asked him, and he would have given you living water." Asking for a drink, Jesus looks back to the story of the well and its place in the great story of Israel; and he looks forward toward the cross and the thirst he will suffer there. One of the early Fathers of the Church (John Chrysostom) put it this way: ‘the woman came to draw water but she lighted upon the true well’. She encounters the Christ, the true well of life, the one who meets our deepest and most urgent need. It is a fragile moment of painful truth when she admits the truth of her relationships; even as Jesus admits that he is the Messiah and, using richly metaphorical language, talks of the water he offers as a source “gushing up to eternal life”. That is a moment of transformation: she enters into freedom. Some simple questions come to mind as I think about how we as a people may respond to this gospel and the rich symbolic language that draws us deep into our inner being. · The second question is ‘where do you go?’ If it is to a church, is it a place that extends you, mind and soul? · There is also a third question: ‘what do you give?’ This is not about the collection! Rather, remember that the woman at the well put herself on the line – it would be true to say that the life we receive is the life we give.